In February last year I started writing my first Node.js App, csblogs.com, alongside Rob Crocombe. The application has run without too many issues since then, serving around 1100 unique visitors per month. However, because it started out as a prototype we didn’t follow many of the best practices we should have done, and its starting to show now we want to extend the application. Since writing a more complicated application at Trainline — which provides an API to clients and consumes many Windows Services, RESTful APIs and Redis Caches itself — I’ve realised how important it is to be using good software engineering techniques and tools from the very beginning of development. Whilst most of the concepts in this post are language independent, the example tools I explain are all geared towards Node. These first few things are obvious, and are things you should be doing in all your projects. Source Control everything, even prototypes. 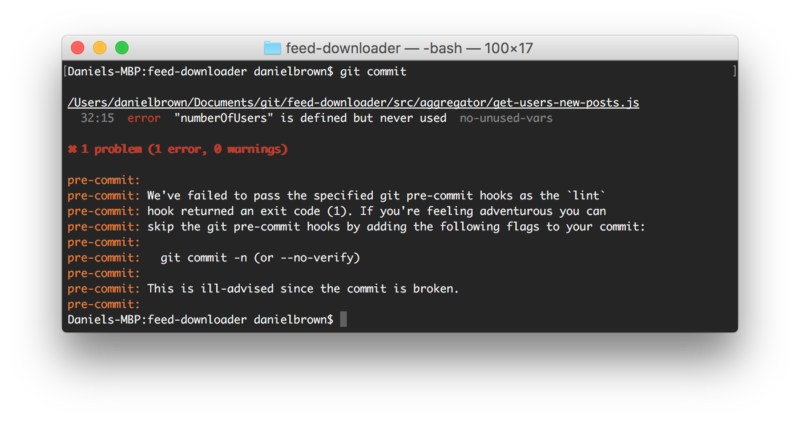 The minuscule amount of disk space a git repository will require, and the few seconds every so often to write a commit message will be incomparable to the amount of time you will save by being able to revert a change, or check when changes occurred. I’ve taken to using Github’s variant of the git flow pattern in which branches are deployed to production and only merged into master once they have been tested “in the wild”. This means that whatever code is in master is always certified as working in production and can be relied upon to be rolled back to in the event a new branch doesn’t work as intended. I like the WordPress Calypso Branch Naming Scheme to make it easy to understand what is being developed in each branch. If you don’t like that naming convention or it doesn’t suit your needs, thats fine. Choose a naming convention and stick with it. As with so many stylistic choices in Software Engineering it isn’t the style that is important but the uniformity and consistency it brings. Things like how to run your build, test and deployment scripts shouldn’t be changing so often as to be a pain to keep up to date. The data and functions exposed however may change reasonably often, especially if you are iterating whilst developing an API, so in order to make that task easier I suggest you use something like Swagger.io. Testing code is one of the things that, 5 years into learning about developing software, I’m still learning about and still eager to learn more about. Good quality testing can be the difference between a bug rearing its head in production and costing you thousands of pounds and it being caught, thought about, and fixed earlier in the development cycle. Automated testing also means that you can be confident that any changes you make won’t be causing regression bugs. When writing a new class, I first sketch out the interface — e.g. the public constructors, functions and data that the class will expose. Then I spend some time thinking about all the potential edge cases, as well as the ‘happy path‘ through each of the functions. For example, what should happen when an invalid BR code is provided to the constructor? What happens if GPS coordinates cannot be determine due to faulty hardware — or in the case of html5 geolocation lack of user permission — in the determineLocation() call? What data should I get back from each of these functions? Is there a timeout after which the function should return an error if it hasn’t completed? Once I have an idea of the expected behaviour of the class I start writing test, in a Behaviour Driven Development way, using the Chai Assertion Library and Mocha Test Framework. There are many advantages to use BDD, one of my favourites is that you dont write names for your unit tests, you state the expected behaviour in a full sentence — this makes it so much easier to realise the intention of the test and makes it so that test code can, in some senses, document the application code. Another great attribute of BDD is that it allows you to think in terms of what you want your code to behave like, rather than implementation details. An additional benefit of linting is that, depending on which linter you use, you get static analysis of your code provided to you too. This means the linter can point out any variables you have defined, but haven’t later used, for example. Linting and Testing is all well and good, but you need to have the members of your team buy in to using it. And, even on a one man team, I often forget to run tests and linting before I commit code resulting in broken builds and ugly code being in the master branch of my respository. Pre-commit hooks to the rescue! Configuration is an important part of any application. It can be as simple as wanting to be able to change which database you want to connect to when on your location machine vs which one you connect to in production, however you don’t want this information to get into the public domain! I used to use JSON files for configuration. However, these could easily be accidentally committed to git and make the secrets they contain public knowledge. Recently I’ve opted to use Environmental Variables for all the reasons outlined by Twelve Factor. The dotenv module for Node.js makes environmental variables easy to change in development. In the CSBlogs applications I’ve been writing I provide a sample.env file which includes all the names of environmental variables developers should be setting to get the app working in their local environment.